Breakfast has long been touted as “the most important meal of the day” and I’m pretty sure it’s the one my boys love the most. We love to enjoy a good family breakfast on Saturday mornings, but during the week our morning are much more frenzied in the morning rush to get out the door. Since high school, I have often reached for Carnation Breakfasts to start my morning off right. So, that’s what I turned back to when I knew I needed something to help me get my fuel in the mornings. And I figured how can you go wrong with cranberry chocolate muffins? The biggest problem I have is finding time to eat my own breakfast. This is where Carnation Breakfast powder saves me! I can join my little ones at the table as they finish up their breakfasts and not have to rush to eat my food while it’s hot or hurry before they loose patience and throw a tantrum. And I still start my day satisfied, not hungry. So how is Carnation Breakfast powder a good solution for your family? 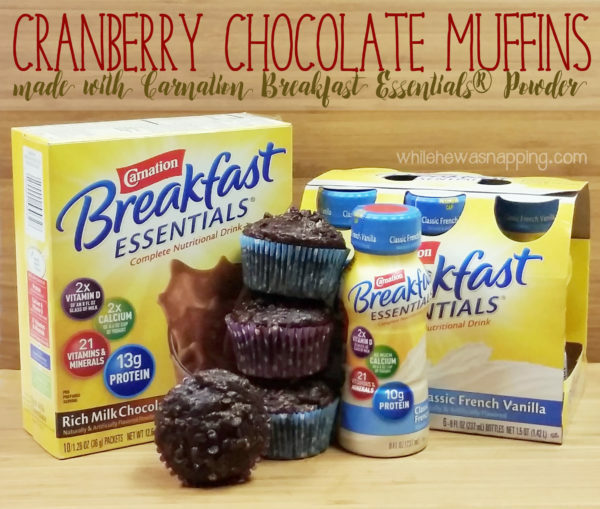 These grab-and-go Cranberry Chocolate Muffins, made with the Carnation Breakfast Rich Chocolate powder, will fill you up and leave you ready to face the day on those busy mornings. And you can start your day off on a nutritious note; each muffin is only 176 calories and 15.4 grams of sugar! 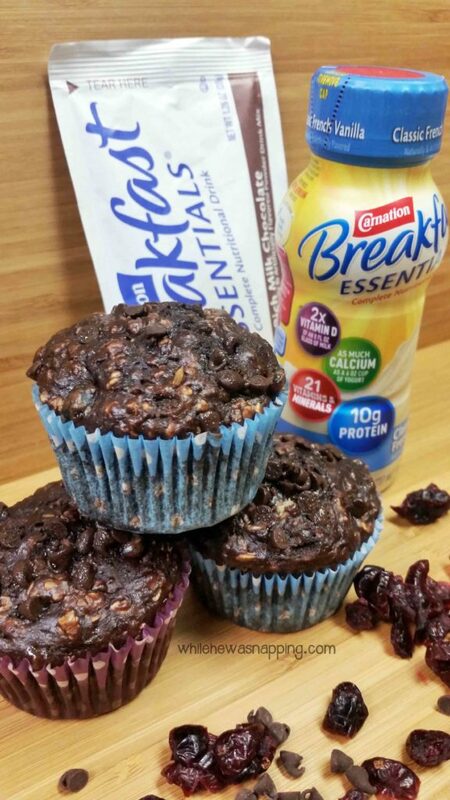 A grab-and-go muffin that will fill you up and leave you ready to face the day on those busy mornings. Each muffin is only 176 calories and 15.4 grams of sugar! Preheat the over to 350ºF. I mixed my muffins up in my stand mixer so I just combined everything all at once and let it mix for three minutes. If you don't have a stand mixer, start by mixing together the flour, oats, soda, Carnation Breakfast Essentials® powder, and the cocoa powder in a large bowl. Add in the coconut oil, eggs, applesauce and milk. Add the cranberries and mix until well combined. Line a muffin tin with paper liners and lightly spray the liners. Fill the liners ¾ of the way full. 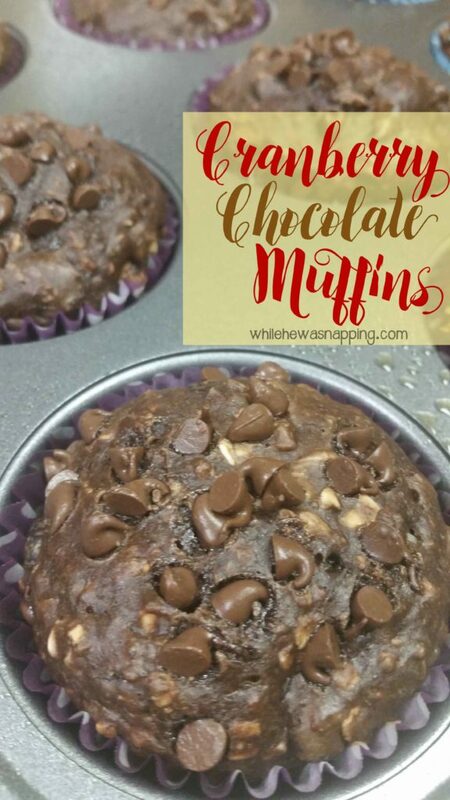 Top each muffin with about a tablespoon of Mini Semi-Sweet Chocolate Morsels. 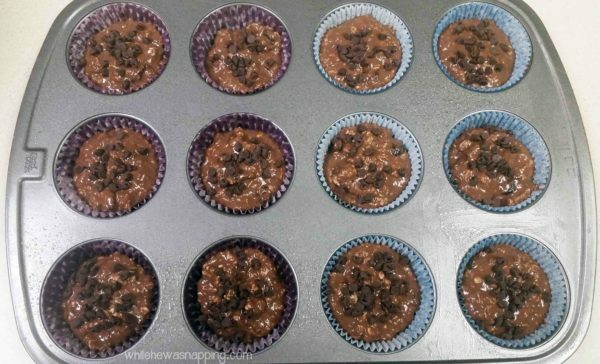 Bake in preheated oven for 15-20 minutes or until toothpick comes out clean when inserted into the middle of the cupcakes. 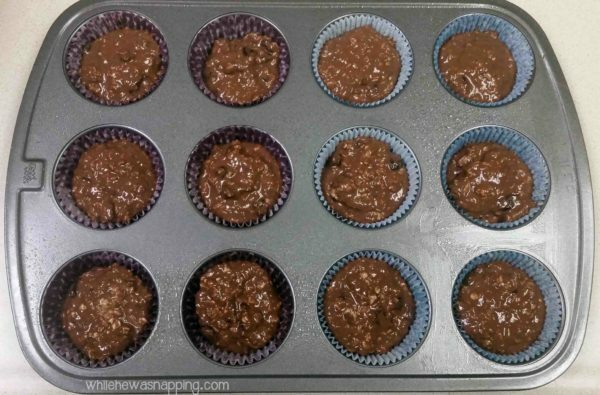 When cupcakes are done, remove from oven, cool 5 minutes and remove from the muffin pan. 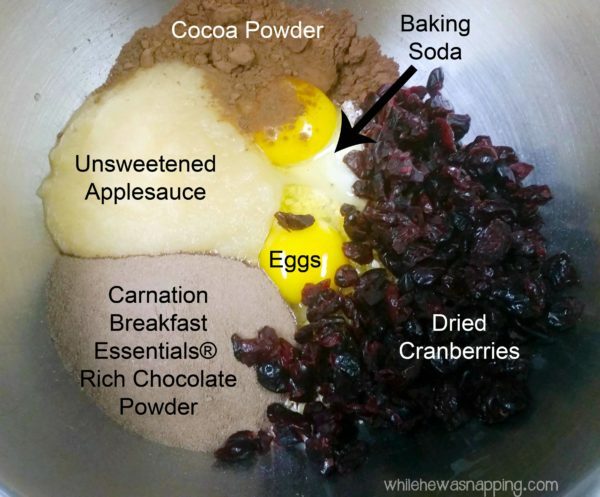 In place of cocoa powder, you can add another packet of Carnation Breakfast Essentials® Rich Chocolate Powder. It's still only 185 calories and 17g of sugar! You can soak the rolled oats in the milk for 5-10 minutes to make them softer and not as dry. The oats will also soften if you store the muffins in a sealed container for at least 12 hours before you eat them. These muffins are such a great grab-and-go option when I’m rushing out the door too! Are your breakfasts less than awesome? This is something my family – and more specifically, me – has plenty of room to improve upon. Carnation Breakfast powder has been there for me for the past 15 years and I’m not about to change that. The vanilla was my go-to breakfast every morning. I struggle with eating when I first wake up and a Carnation drink was enough nutrition to start my day out right without filling my stomach. Over the years, I’ve come to love the other Carnation Breakfast flavors and products too. If it’s not broken, don’t fix it, right?! Carnation Breakfast powder works for me and my family. These Blueberry Pecan Granola Bites are the perfect pair to power start your mornings! Click to get the recipe! Thanks, Erin! We definitely enjoyed them!